Note: I was going to do a review on the X-Men trilogy tonight, but I changed my mind after watching Blue Valentine last night. Seriously, I've been chomping at the bit to do this review all day. When I was young, I was always under the impression that I'd grow up, get a really good job, fall in love, get married and have children. It was that simple. Those thoughts were often surrounded by beautiful colours, fountains of hearts and any other form of happiness. But as time has gone by, that dream is slowly becoming dimmer. I don't know whether it comes from the fact that I've realised just how much cynicism there is in the work, or the fact that my parents don't live together anymore...or maybe it's just that I watch too many movies about marriages. I think most of those movies do sugarcoat married life a bit, though. However, watching Blue Valentine completely made my dream the darkest it has ever been. Yes, the film was a little too close to home, which made it all the more depressing, but seriously? I never want to fall in love now, for the fear of falling out of love when it's really just too late. 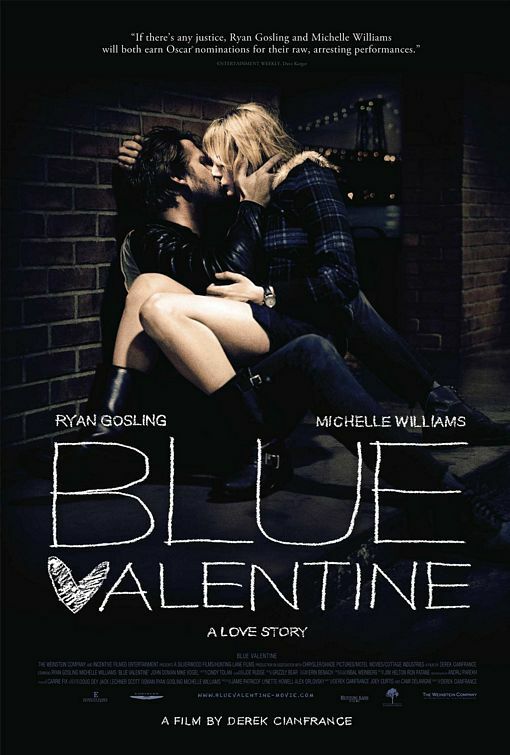 The tagline for Blue Valentine was simply "A Love Story". To a degree, that is true. Dean (Ryan Gosling) and Cindy (Michelle Williams) were once in love, which led them to get married and have a gorgeous daughter, Frankie (Faith Wladyka). Their love story would have been good on it's own, and would have made for a just about perfect chick flick of some sort. However, woven into their happy love story is a weekend in the distant future which visits Dean and Cindy, now just your average married couple, struggling to stay together. Dean hasn't changed much, but Cindy appears to be worn out - which is probably the result of Dean's slight immaturity and trying to juggle work and being a mother at the same time. So really, this film is about what happens after all of the romance and fireworks. If this film was in chronological order, then it probably wouldn't have hit as hard. Having the two time periods cutting into each other is just like watching positivity fight negativity, with the latter always ending up on top. That's not to say that this movie is always depressing. There are some genuinely sweet moments, like the tap-dancing/ukelele scene between Dean and Cindy in their early days. Even during the later days, it's kinda funny seeing the pair in that slightly strange 'futuristic' hotel room, trying to reignite their relationship. There's a slight goofiness in what Derek Cianfrance is trying to achieve - it may not be fully realised, but you can see this coy attempt at a cheesy rom-com subtly coming through. But you've really got to hand it to Cianfrance, because when most people make a movie that they want to hit the audience really hard with, they decide to make it the most depressing experience ever. With it's slight sense of humour, it's a lot easier to believe Blue Valentine and it becomes more realistic. Sometimes directors just want you to feel really miserable, but Cianfrance wants you to feel for these miserable people. The cross-cutting technique is used to full effect, making this ingeniously depressing. That may be a strange claim to make, but trust me...if the final sequence had been left without it, I probably wouldn't have bawled my eyes out for the rest of the night. The way Cianfrance mixes the scenes, so they each contradict each other, is pure genius. As I said, this film is like watching what happens after all of the romance and fireworks. You just get a better idea of the 'before' and 'after', which definitely does make it all the more depressing. Ingeniously depressing, to put it correctly...you can quote me in the future. Ryan Gosling and Michelle Williams are also ingeniously depressing. They simply are Dean and Cindy. Is it possible to get better young actors than these two? How Gosling got ignored by the Academy for his performance here is beyond me. He's the picture of masculinity which meets naivety and immaturity. He's a romantic who was unfortunately very easy to get tired of. Gosling just gave it everything he had, and this confirms for me that he might just be one of the best young actors working today. Michelle Williams, who was recognised by the Academy for her work, is every inch a winner with her performance. She plays a damaged character so well, and even manages to get a bit of sympathy even though her character is probably the evil force driving her relationship apart. Together, you forget that they are acting. They are so great together that you feel every twang of pain when an insult is hurled, every throb of happiness which comes with a compliment, and you feel like your world has fallen apart at the end, thanks to Gosling and Williams. Yes, Blue Valentine is extremely hard to watch. But I feel as if a movie hasn't fully rewarded me if I don't feel completely involved with the characters, to the point that I am probably in tears at the end. Let's just say, this movie was definitely rewarding. The credits were made with colourful fireworks, which pretty much summed up my happiness with this movie. I'm happy for the way it turned out, and I'm happy about how much I liked it. I don't want to overrate it, but this is definitely the best movie I have seen this year, so far. THE VERDICT: Derek Cianfrance has created a movie which is raw and realistic, moving and depressing. The performance from Ryan Gosling and Michelle Williams are simply perfect, adding more fuel to the fire. It made my Top 5 for 2010. I now own the DVD too! Such a powerful film, and those performances are top notch. I was really disappointed when Gosling missed out on an Oscar nom. I was thinking that you were going to give it the 'Nice Ascot' rating there, and then I would have serious words. You have made me want to watch the film again so badly now, but Jesus, I don't think I can put myself through that pain again, man. But it will be interesting to see how it holds up again, what with me having been so emotionally invested in the film for months after. And to an extent, I still am. I intend to get the DVD A.S.A.P! I was so disappointed to have missed it at the theatres, but I was outraged Gosling didn't get a nomination on the behalf of those who wanted him to! I was under the same impression as you growing up - I'd get a great job, marry and have kids (says a lot for the role of women, we just assume we'll be mothers! ), and sometimes I still like to pretend that life will be just fine and dandy - but with films like this, and life in general, its getting harder and harder to ignore the reality. I agree with every single thing you wrote - the movie is beyond amazing and Gosling and Williams are just so, so good. And I was also surprised that he was not nominated. I'm sure he could replace like... Eisenberg or Bridges. I mean no disregard for their performances, but honestly... Eisenberg, fine, but Bridges has been up there a thousand times, gosh... and I didn't think that his performance in True Grit was *that* special in comparison to Gosling's. But, you know, he wasn't nominated for Lars either - though 2007 was quite the year - so I'm not surprised. Plus, it's the Academy Awards, if you know what I mean. Watching it tonight. So excited. Will probably review it, too. Andy - It's officially made my unofficial reconstructed Top 5 of 2010 now, too :D And I'm so jealous of you having the DVD! I'm hoping some kind person will get it for me for my birthday, haha. I don't even know how Gosling didn't get nominated. The Oscars were pretty off the mark this year. Cherokee - I had to give it the I Was Perfect rating. Bloody hell, I felt so compelled to write a review on it I was willing to stay up until the wee hours of the morning just to do it, but I had school the next day. So instead I spent the whole day wanting to write the review, which made me think that it should get the top rating. I've never felt so compelled to write a review in my life. Gosh, the end was so sad. I kept wanting to use that as an example for the great intercutting, but I couldn't in fear of spoiling. I cried so much that my cat was pretty worried about me. And I got really sad over the dog too! I've never been in any relationship, but it did hit home for me thanks to my parents. Such a happy experience, this movie was. And thank you! I feel my reviews are getting quite personal and I find myself connecting films to my life a lot more...is that bad? Ruth - I was like you - outraged at Gosling not being nominated, without even seeing the movie! Seriously, he should have been nominated, end of story. Maria Sofia - I'm glad you agree with me! Eisenberg deserved his nomination, and so did Jeff Bridges. But to be honest, Bridges always turns in a good performance, and he doesn't need to be rewarded for that every single time. Mind you, I would have rathered Bridges win this year instead of last. Gosling should have got in though, because he was beyond brilliant! Tyler - I hope you like it, and I look forward to your review! It has been nearly 7 months since I have seen it, so I think I am ready now...sorta, probably not, but I want to watch it again! I have been in the kind of 'watching depressive stuff' mood as-of-late, (probably down to having this horrible on-going cold for like a week now) so I think that Blue Valentine will pop up in my selection of films to watch. Teenaged relationships aren't worth the agro, trust me. It's not bad at all man! (Unless that was supposed to be a rhetorical question and I wasn't supposed to answer). Art is all about connecting with your own life - getting deep here. Cherokee - Thanks! Do you have a link to your review? I'd love to see what you had to say about it! I think you're ready. So see it again! I'm sure it will hold up. It probably just won't hit you as hard emotionally. Aw no, I hope you get better soon! I know what you mean though. All I want to watch these days are bloody movies that make me cry. In drama we are doing The Diary of Anne Frank, and we watched the 1959 version of the movie, and after that me and the teacher suddenly started talking about Schindler's List. The next day, I bring the DVD in because I think it will be a great idea to watch it in our class (I think everyone should watch that movie). Today we were watching the bit showing the liquidation of the ghetto, and our whole class is crying. That is easily the best thing that has happened to me all week. Castor - Definitely gut wrenching! And yes, the Gosling snub is beyond me! Gosling and Williams work so perfect together which had me really believe that they could have this tragic and at times, perfect love. Good Review! Love the review. I have nothing to add. Only, if I'm not mistaken it was my #4 from last year. Dan - I know, right? I kept forgetting that they were only acting! Thanks! Lesya - Thanks! I think this might be my number 3...it beats Scott Pilgrim, just. One of my favorites of last year. I told people every young person should see it. Hoepfully they don't all have the reaction to avoid love forever, but I think it's a good dose of the other side of love and marriage that never gets shown on the big screen but is a harsh reality of at least half of marriages today. Indeed, it had such a real story to tell and it was very real about the way it told it. One of my favourites of last year, too.